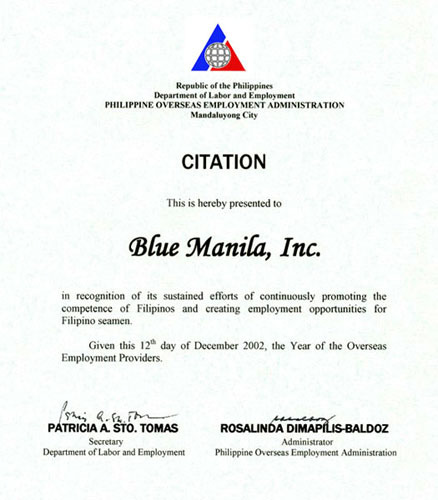 ﻿ Welcome to Blue Manila, Inc. 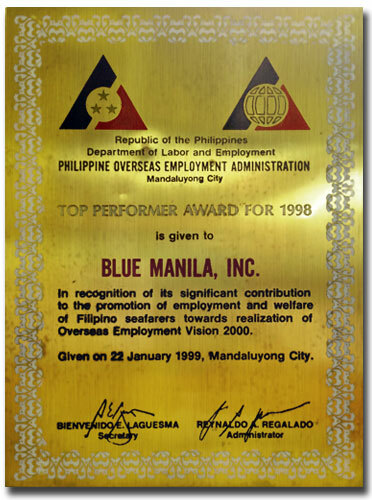 Through the years, we have established and continue to maintain good relations with Government Agencies, Maritime Unions, Training Centers, Medical Clinics, P&I correspondents and other industry partners. 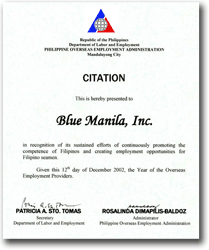 Blue Manila, Inc. is an active member of a prestigious national association, the Filipino Association of Mariner’s Employment (FAME). 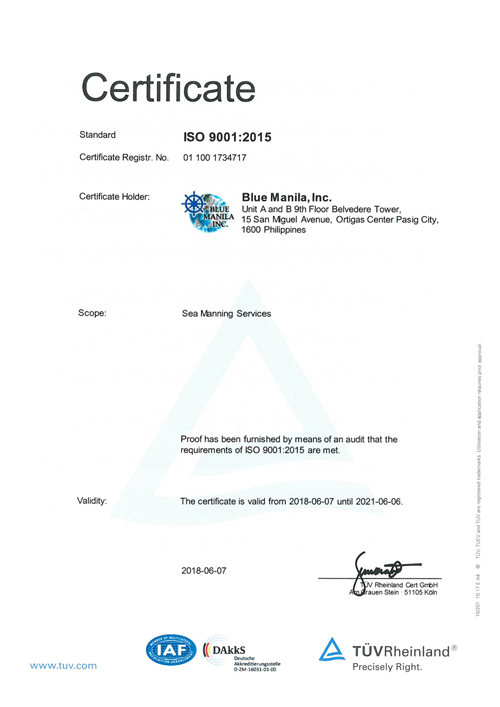 The Quality of Blue Manila, Inc.’s services has been certified by the International Organization for Standardization (ISO) since 1996 as a quality assured company. 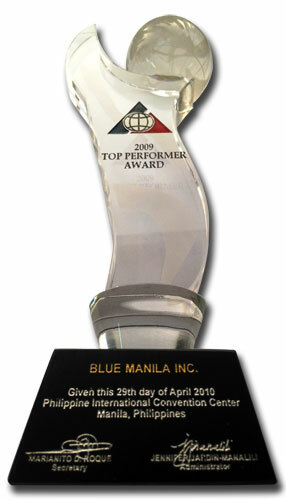 The company has been awarded by POEA in 1998, 2002 and 2009 as one of the agency’s Top Performers in the Philippine Manning Industry. 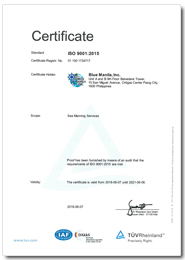 The company has been audited by the POEA last June 15, 2013 and was certified to be compliant in accordance with MLC 2006. 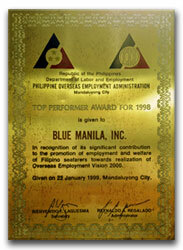 We have earned the privilege to do In-House Processing of POEA Contracts. 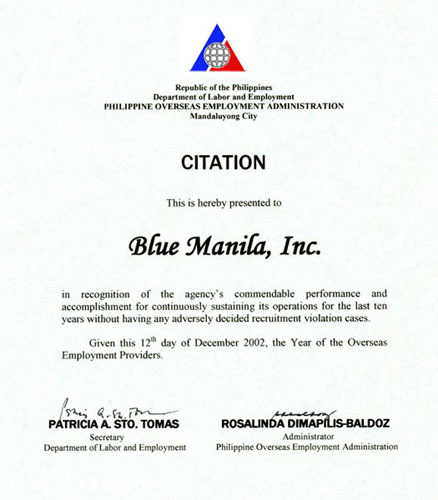 Blue Manila, Inc. continues to pursue its objective to be recognized and remain competitive in the manning industry despite its modest size by ensuring that the crewing services it renders to its principals are carried out in the most efficient and top level manner , providing them with the “ most qualified” “satisfied” and “ motivated” seafarers at the required time and place. The company aims to provide a quality service where our customers have total confidence in our ability to manage the human resource that we are responsible for and on their behalf.